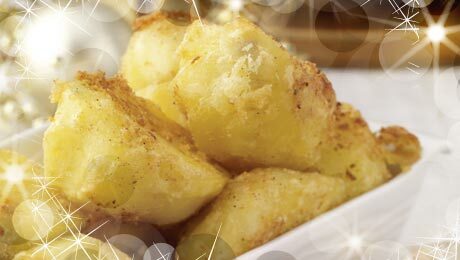 This is a lovely twist to traditional roast potatoes, sure to make a regular appearance on the table. Place in a pan of cold water and cook over a medium heat for 10 minutes. Drain the potatoes and return to the pan, shake vigorously to roughen up the edges. Combine the breadcrumbs, parmesan and parsley in a bowl. Drizzle the potatoes with some oil then dip into the breadcrumb mixture, place the potatoes onto a roasting tray and season with a little salt and pepper, add a couple of sprigs of thyme. Place in a preheated oven and roast for 25 minutes, turning once during the cooking process.